We specialise in tailor-made holidays and trekking in Ethiopia - with a fantastic trekking outfit in the Simien Mountains and a thorough knowledge of the lodges and hotels of this fast developing country. Travelling around Ethiopia is now a very much different prospect to just a couple of years ago. Quality small hotels are blossoming around the country and private tailor-made travel (rather than group travel) is in our opinion, now the best way to see Ethiopia whatever your budget. 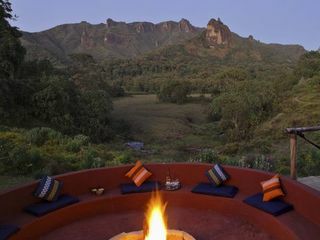 Where once a hot shower was a rarity, you can now see some of the most incredible cultural, historical and natural sites in Africa from the comfort of excellent lodging such as the Kuriftu Spa on Lake Tana and the Bale Mountain Lodge. 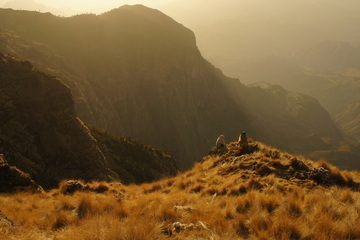 The Simien Mountains offer some of the most stunning trekking in the whole of Africa. 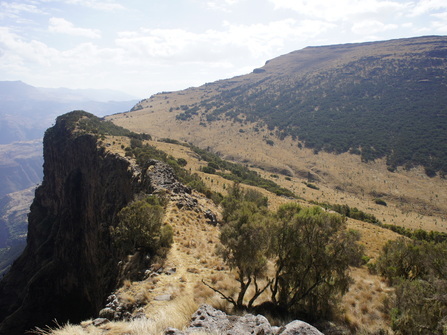 The National Park boasts truly incredible mountain scenery and is teeming with endemic wildlife. We are the leading provider of high quality treks in the Simien Mountains and pride ourselves on the quality of our guiding team and cooks, whether your are camping or staying in comfort at the Simien Lodge. Our trip to Ethiopia was incredible. I’m so glad I made the last minute decision to go with John, it was unforgettable. Alex in Addis looked after us brilliantly as did Getinet and his crew in the Simien mountains. They were both so passionate about their country and eager to share it’s treasures with us. And what a country! The bustle of the city and then the serene atmosphere of the mountains, great contrast. 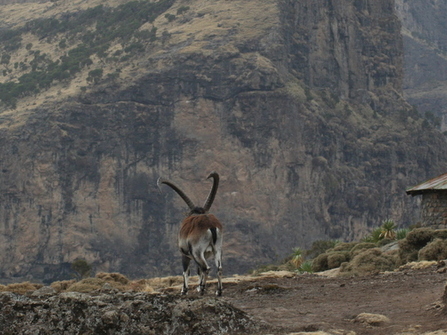 The landscape in the Simien Mountains was awe inspiring, colossal mountains and drops and great wildlife. Our itineraries are carefully designed by our experienced travel designers based on years of experience and customer feedback. For a custom itinerary tailored to you, please enquire giving as much detail as possible on your brief. 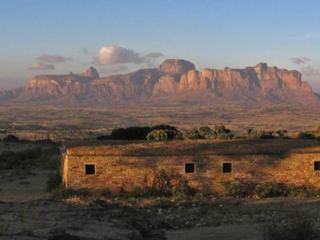 Classic fully supported 3-5 day trek in the Simien Mountain National Park including transfer to and from Gondar. Guide, cook, porters and scout all included. 'From Price' is the average per person price for ground arrangements for two people sharing. 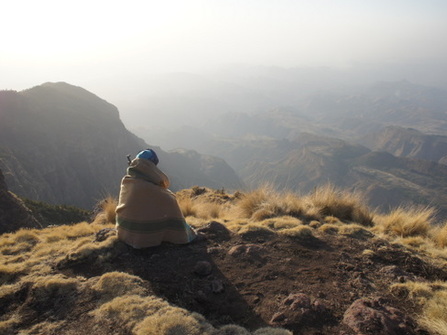 Extended 8 day trek in the Simien Mountains following the classic Sankaber - Chenek route then down to the Lowlands. Combines the popular Sankaber - Geech - Chenek section with a challenging ascent of Ras Dashen & descent to the rarely visited lowlands. A tour of North Ethiopia's highlights in comfortable accommodation, visiting Lake Tana, the Simien Mountains, Gondar & Lalibela. For the non-trekker. Spend 4 days trekking & acclimatising in Ethiopia's rarely visited Simien National Park before flying to Tanzania to climb Mount Kilimanjaro. 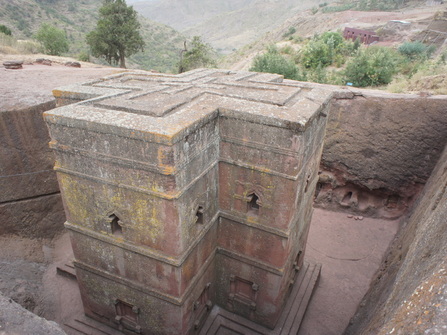 Combines a 5 day Simien Mountain trek with a full tour of the Northern Circuit, including the remote Gheralta Cluster churches. A comprehensive tour of North of Ethiopia including Lake Tana, the Simien Mountains, Gondar, Lalibela & Gheralta. For the non-trekker. 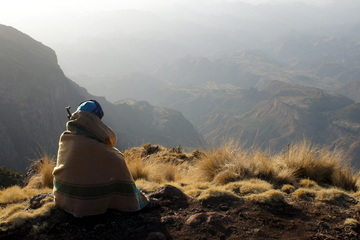 Combine a Simien Mountain trek with the best of the North and the fascinating tribes of the South. We know our onions. Our specialists have vast experience of their destinations. Our prices are often better than booking direct. We'll match any quote from a UK or US Tour operator. As a comprehensively bonded ATOL and ABTA tour operator with 24/7 emergency support we've got your back. Our trip was excellent. Thank you! We were particularly impressed with the way it all worked seamlessly: someone was at each arrival point to meet us (or Alex was on the end of the phone to tell us what to do) or there was a phone message at Reception for when to expect someone. The Jerusalem Hotel in Lalibela is not the same standard as Tukul Villages but it was OK for one night & we had plenty of warning. Lalibela at Christmas is pretty manic: full to bursting! I must say that Alex looked after us well. He came to see us in Gondar to make sure everything was in place for the Simiens Trek & that we knew what to expect. When we got back after it, there he was again! Small but highly-valued pieces of customer care, evident again when he spoke to drivers while we were travelling. All the staff who worked with us were of high quality, especially drivers and guides. Two who stood out were Younus, our driver both times we were in Addis Ababa, who we felt went beyond the call of duty & made our time there enjoyable - our last evening when waiting for a 2 a.m. flight could have been a drag, was in fact absolutely fine because of his suggestions (the Via Via cafe for dinner & then Mama's Kitchen for some music) and company. The Simiens Trek was outstanding. Spectacular scenery, challenging at times, full of interest. Key to making it so was Dereje Gedamu who is a wonderful guide: we felt privileged to have him. he was ably assisted by the other staff & when our first, excellent chef had to leave at short notice to visit his mother in hospital, a replacement was found immediately (at Chenek!) who fed us to the same high standard. It was all a great experience that we will be talking about for a long time. We were all pleased to have selected the 8 day option (& were not at all jealous of the peak-baggers heading for Ras Dashen). The second half of the trek was a good contrast to the high altitude section in the National Park's heartland as we descended through more intensively cultivated and populated areas, down steeply to the river and then back up past wonderful rock formations towards Mulit and out to the road at Adi Arkaye. It was full of interest and we were pleased to be pretty much on our own, rather than with the crowds at Geech & Chenek. By comparison, the TESFA trek was rather tame, although an interesting comparison to see a more pastoral landscape and less remote villages. We had another good guide & enjoyed the lunch & evening stops, and the "loos with a view". Pleased as we were that we had opted to drive from Bahir Dar to Lalibela, we had mixed feelings about driving the rough Gashena-Lalibela road three times - the starting and finishing points for the TESFA trek were just beyond Gashena. In 3 years when the road is complete this point may become academic, but meanwhile - if anyone else wants to do the same thing - it would be better for them to drive from Bahir Dar to Gashena, meet the TESFA crew there, do the trek & then continue to Lalibela. I am sure that TESFA could look after any extra baggage that people did not want on the trek. One other point about the TESFA trek: we were not aware that there are several grades offered. I think we did the easiest and might well have preferred something more challenging so perhaps you could clarify the options available. Only one other critical comment: we were underwhelmed by the Mayleko Lodge near Gondar airport. It was indeed welcome to have somewhere peaceful to return to after the trek, the rooms are nice & a couple of us enjoyed a "refreshing" swim, but on the other hand the restaurant was pretty mediocre and slow: we might have preferred to be out in the town. Apart from that it was all good! A glimpse of Addis and another of Gondar; trekking with some R&R in Bahir Dar with its different scenery and history, ending with the religious fervour at Lalibela. A great holiday. We had an excellent, stretching , fascinating mix of history (sites) , tough trekking , and wonderful views .. From the many treks that I have done to places including Nepal , Italy , Croatia , Crete , Myanmar , Japan I would judge that it would be very difficult to beat the 7 days that we had in the Simien Mountains .. Tigrai was spectacular for those willing to climb to all the churches. ( there’s a challenge for you to suggest the next adventure !). Our guide Abebe was really excellent ( fit, engaging, knowledgeable and with a good sense of fun/humour ) and I would not hesitate in recommending him, the quality of the tents was excellent except that there were only 3 two man tents which were much roomier than the singles. We saw very few other people which was perhaps just as well in view of the loo situation at the camp sites. The food was reasonable .. in fact too much pasta and not enough rice. We certainly needed the heavier sleeping bags as it was very cold the first two nights out. On the negative side .. the long drop loos at Geech were frankly a disgrace .. you could not stand in there for all the crap around and the smell ( even in the freezing evening ) .. surely they should be cleaned every morning / evening. The result is people are crapping in other places round the site .. not nice ! There was no water for washing at Geech ! At the Chennek camp the long drops were only marginally better but there were two dribbly very cold showers at least ! If the tourist board want to encourage tourism clean loos is the absolute must. The trekking times were generally accurate which was a change as in most other treks that I have been on they are 25% overestimated. Our final 11 hour day was tough but perfectly achievable for fit walkers. I am glad we did not break it into two tranches … we had time to stop for a swim/wash in the river/pools and it was fantastic to spend two days at Geralti Lodge before our return. Addis is a bit of a disappointment but it was certainly worth spending a couple of hours walking the Mercato ( although you have to be very careful not to lose the guide !). I thought Axum was disappointing by comparison with Gonder and Lalibela and not really worth going to. We had the most fantastic time and loved the country and its people. The tour worked really well and including the internal flights meant that we could maximise our 2 weeks (if we had of had more time sure the drives would be lovely!) - the pace of it was busy but just right. You really put together a trip which showed us the beauty and culture of the North. I loved all the walking and timket was amazing. The advice just take yourselves and leave everything else at home for timket was perfect as we were free to just enjoy the experience - I have never experienced anything like it. The thing that surprised me about the trip was the variety and how each day was so different. The people were so warm and friendly and children were absolutely enchanting - the contrast of the privilege of children I know here and those living in poverty in Ethiopia is very humbling. Having a driver guide worked extremely well - lema was excellent, he really added to our holiday through enabling us to have interaction with local people - he clearly had a way which gained acceptance and thus acceptance of us - for example with a family making injera and farmers threshing. He is a real ambassador for his country and was such a caring guide but also great fun. We always felt safe and he was an excellent driver - even when conditions were not easy. As we had local guides everywhere, I think having a driver and a guide plus local guides would have been a bit too much. The local guides were all very good or excellent. They clearly had good relationships with lema and again I think this meant we in turn had a good experience. The accommodation was generally very good/ excellent. We actually preferred the guest house we stayed in on the final night in addis to the regency hotel ( cannot remember the name but Stephen took us there - it had more character) I particularly liked fasil lodge as had great atmosphere, and gheralta was fantastic. 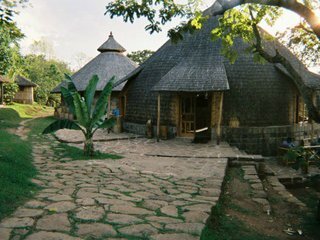 I also liked lalibela lodge. I thought Kuriftu lodge was good but slightly impersonal. However, You did warn us and i know I wanted to stay in the park so this is not a complaint about tour dust or itinerary at all - I realise that they have a monopoly so unlikely to change but wonder if agents have any more sway in feedback than individuals. It is a shame as the lodge is in great location and the rooms, solar heating etc are all good. I would contrast the simien lodge with the gheralta lodge which likewise has a captive audience but provides food of much higher quality and drinks at reasonable hotel prices - I know Kate would have preferred local food but I was very happy to have good Italian food in such a lovely place. It was the perfect place to spend our last couple of days. Thanks for organising such a great holiday - I would highly recommend tour dust to anyone travelling to the countries you cover and I am promoting ethiopia as holiday destination at every opportunity! We had a wonderful 2 week trip to Ethiopia - we found the country very different from other places that we've been, and also found Ethiopia very different from what we'd imagined it would be. The wildlife and birds we saw were incredible, the mountains and views nothing short of spectacular. We found different parts of the country varied hugely - both in landscape, climate and wildlife - which made the trip hugely varied. The travel arrangements (internal flights included) all worked perfectly - and our guides, drivers and cooks were all professional, friendly and keen to help make our trip as enjoyable as possible. As a vegetarian, I really enjoyed the variety of food (the local beers and wines were great too! ), and we found all the hotels we stayed in very comfortable. In particular, the Kuriftu spa was a lovely treat after having spent 5 days in the Simiens trekking. We probably tried to fit too much into our 2 week trip, and were feeling a bit tired by the time we came home, but we would certainly have no hesitations in recommending both Ethiopia and Tourdust to anyone! As Steve has already said it was an excellent trip both northern and southern parts. We had wanted to gain some insight into the people and the cultures, appreciate the landscape and the wildlife and get out of the mainstream so that (as far as is possible for a white tourist!) have some authentic experiences. We feel that the design and planning of the trip enabled this to happen. This was due in no small measure to our wonderful guide for the Southern part of the trip Ermias Tamiru together with our lovely and extremely efficient driver John (Yohannes)…..more about them later. It is taking us some time to readjust to being back in the UK even after only 4 weeks away. It was a very powerful experience for us experiencing the generosity of the Ethiopian people and the beauty of the very varied landscape whilst observing up close the very high levels of poverty and deprivation of the people. We were glad that we visited small towns and villages and met local people. It is very helpful and appropriate to have local guides in each place because you get and insider’s view of the lifestyle and important local issues. Also it is a more respectful approach. People in Ethiopia are intensely proud of the country and of their own ethnic culture so they are the ones who should be talking about it! We knew we would get on with Ermias and John as soon as we met them. They were both warm and welcoming and very flexible and keen to help us do and see the things we were interested in. Ermias speaks excellent English which means we had an easy flowing dialogue and could discuss everything as we travelled. He is knowledgeable about history and culture and keen to exchange ideas so it helped us to gain perhaps a more realistic insight into Ethiopian life. The balance of basic accommodation/camping and smarter lodges was fine. You were right about Aregash - what a great place to stay. The owners have a very personal approach which is very welcoming. Quite a contrast with Bishangari Lodge which we felt was one of the places in Ethiopia where Ethiopians do not feel welcome. The natural beauty there is intense and we loved it from that perspective but 2 nights was enough. We had an interesting time in Gidole. We lucky that the local Derashe dancers and singers were practising that day for Nations Day in Adama and we were taken along to see them. Great! Tikimtu was very hospitable and we were interested in the area. We camped in a place with no facilities at all which was fine for one night but probably not something which could be done regularly. We struggled to see Gidole as a tourist destination although it was fine for us as we were keen to have local experiences. By contrast Lephis seemed to have a lot more going for it. The walk through the forest up to waterfalls by mule was great. The birdlife is abundant. There is definitely potential there. We had a good time. The organisation was superb – we had been provided with a detailed itinerary and it worked like clockwork! We were met in everywhere we should have been, the hotels, lodges/local accommodation were expecting us and meals and transport were available as indicated. Ermias made sure that everything was in place in the south and we felt very confident with John’s driving. All in all our trip to Ethiopia was truly amazing. A dizzyingly precipitous bombardment of beauty in the form of flora, fauna, people & scenery! - Despite the information we were given about the sleeping mats provided before we left I would recommend that everyone brings their own sleeping mat. The mats provided are tired - thin, cotton covered, very squashed foam - in conjunction with rocky camps does not make for a comfortable night along the way. I know it depends on the season but most of the camps hit well below zero at night, a survival blanket on the ground sheet of the tent was invaluable (very cheap, light easy addition to a kit list bringing increased comfort). - Food overall was excellent. We had an excellent cook with a very good reputation, he was used to catering for Western palette's & offered daily variety. The local wine was a really nice touch after a tough day. - Our guide, Hope, was very knowledgeable & we felt safe on the routes he took us, on occasion some of the group felt that he rushed ahead (there was quite a gap of fitness levels so we were quite spread out when we were walking) It would have been nice for him to offer a bit more support to the ones who were struggling & aimed to keep the group a bit more together but on the whole he was great. - The main point to raise is that we all felt that this trek is not one for novice's or 'anyone with a reasonable fitness level' - on occasions it was gruelling. All of us, fit to less fit, had to dig deep into reserves to keep going. The Ras day was hard but again we felt unprepared for the final part to the summit - it is more than a scramble, it is a climb - the scouts went above & beyond the call of duty at this point & helped those who were struggling. I would rate the trip 4/5 which I think would be the average of the group. 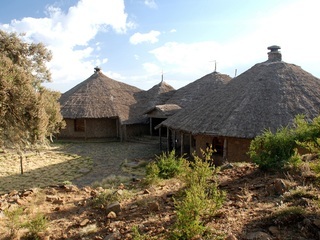 I would like to recommend a newly built lodge on the outskirts of Gondar near the airport named Mayleko lodge. It was a wonderful place for R&R after our trip & the owner, Ethiopia, really pulled out all the stops to make our stay as comfortable & relaxing as possible. I think that is about everything, like i said we had a fantastic time overall & we all have lots of happy memories. We have had an amazing time in Ethiopia, time went too fast even though we were 7 years behind and 6 hours adrift some where. I believe in true feed back to assist in further development . Airport pick up didn't matter as was soon resolved, however obtaining a visa was painful. We waited in the queue for one hour forty five minutes, it seemed disorganised and open to those knowing how to to queue jump. Perhaps on a day flight this may not have been too bad, but we just needed to get our heads down. Hotel in Addis Ababa was well located and more than comfortable , nice to have a kettle in our room (the only hotel to have one ) with a early morning transfer to Gondar they obliged with boiled eggs for breakfast to take away. Classes. Food a little expensive compared to elsewhere. Flight and transfer to Gondar good, accommodation well situated, afternoon round castle etc was interesting but guide needed to understand ' less is often more ' scripting is never interesting. 70 % is what we see , let us look rather than force their history upon us. The trekking - WOW David was fantastic, he knew when to offer information and when to just let us look, so knowledgeable, the views were breath taking the cliffs were pulse raising, the baboons were mind blowing, even the three hours of constant hail and rain couldn't dampen our love for our experience. Our scout was a diamond in his jelly shoes, at a grand age of 70 he guarded our possessions as if they were his own. Alam our cook prepared some amazing food throughout, and although he looked worried at me not being able to digest bread , I was fed more than adequately and never went hungry. Flying up to lalibela was smooth, my mind constantly drifting back to the mountains wishing I could still be there , I loved the isolation of our trip , so pleased we didn't have to share it with others. The churches were extraordinary, at times I felt rushed by our guide, I love to photograph, but he seemed bent on filling me full of history. Just to confirm that we returned from Ethiopia today, as planned, and that all went well - extremely well indeed with our trip. In due course we will share with you fuller reflections... Meanwhile, many thanks to you and staff at TourDust for helping to arrange a very memorable trip. Our trip to Ethiopia was incredible. I’m so glad I made the last minute decision to go with John, it was unforgettable. Alex in Addis looked after us brilliantly as did Getinet and his crew in the Simien mountains. They were both so passionate about their country and eager to share it’s treasures with us. And what a country! The bustle of the city and then the serene atmosphere of the mountains, great contrast. The landscape in the Simien Mountains was awe inspiring, colossal mountains and drops and great wildlife. Beautiful people. 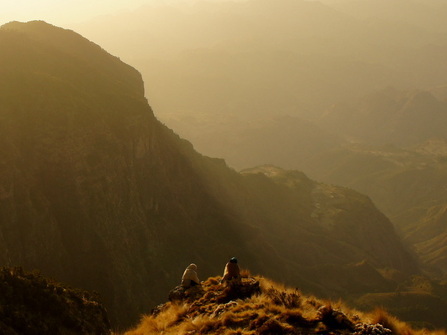 This itinerary gave a fantastic overview of the Simien Mountains – both the scenery and the people. The initial 4 days allowed a real exploration of the high plateau and the latter 4 days gave a great, close up experience of village life as the trek wound its way back to the lowlands. The whole experience was excellent. Our guide, Melaku Berihun, was well organised and very informative. His English was excellent and he was an interesting companion for our 8 days. His understanding and compassion for many of the people we encountered, and his gentle advice on how to deal with situations where people ask for things, was much appreciated. Our cook produced the best food we had eaten in the month we had been in Ethiopia. His evening meals were to be looked forward to and were varied and nutritious as well as tasting great. He had a good-humoured team of young cook assistants whose humour we enjoyed. Our scout was also a delight. The standard of the tents and sleeping mats was perfectly adequate although the tents are beginning to get rather ‘tired’. As experienced campers, with our own sleeping bags and additional mats we were perfectly happy. The pick up from the airport and transportation to the start of the trek was faultless, as was the return trip. All in all, the service we received was first class. Your Tourdust Initial Trip Dossier was very comprehensive and we feel it covered all the pre-trip issues well. We've just returned from an incredible trip to Ethiopia, covering the classic northern circuit, the Simien mountains and the rock churches of Gheralta. Friends are asking which part of the trip was the most memorable but everywhere had its own special feel and we were constantly surprised and amazed by this extraordinary country. Our main reason for the trip was to visit the churches at Lalibela, but I think the churches of Gheralta made almost more of an impression as they were so unexpected - and the views from some of them are incredible! We had an excellent guide in Ermias and also an excellent driver, Mikael. We loved the coffee and the Ethiopian food - just ask for rice if you can't face injera - and had an especially good fasting/vegan buffet one lunchtime at the Fasil Lodge in Gonder. On the whole the hotels are all clean and comfortable and we had hot showers everywhere. Go to the local markets - they are fascinating. We talked with Ben a lot before booking the trip, planning all the different stops and changing our itinerary from some of the set trips. We had two full-day drives, rather than internal flights, which was our choice as we wanted to see the country, but they are long, dusty days and the roads are still under construction in some places! However, the countryside is fascinating and you get a real feel for the place and the people. Everything went smoothly, which isn't always the case in Africa, so I can only commend Ben and the team in Ethiopia for making sure this was the case. Ethiopia is a wonderful, surprising country. I had an exceptional trip to Ethiopia with Tourdust at the end of last year which has inspired me to explore Africa further..
Just wanted to let you know that we had a great time in Ethiopia. Everything went to plan (except the weather in the mountains) and all the guides were excellent. Everything went very smoothly and the scenery at this time of year was stunning; very green with lots of flowers in bloom. The team who were with us on the trek made it a very memorable trip; the guide Mulat was extremely knowledgeable and always eager to help. Warki the Scout, Alum and Fetalo the cooks and the muleteers were always great company and full of Ethiopian hospitality and all added to the experience and helped us to master some basic Amharic phrases. The food throughout the trek was very good and Alum prepared a really varied menu that probably would have been hard to achieve in a modern kitchen never mind in the mountains. 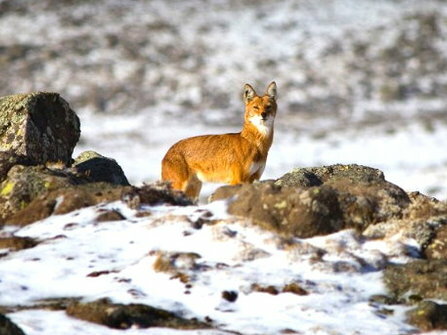 The trek was definitely the highlight with stunning scenery and amazing wildlife, we were lucky enough to have 2 Ethiopian wolves come into the camp at Chennek and got some really good photos. I think the thing that struck us about this trek was that it really felt like an adventure and away from the main tourist routes. All 3 hotels we stayed in (Regency, Addis; Fasil Lodge, Gondar; and Mountain View, Lalibela) were very good and all the staff were incredibly helpful. The rooms were spacious, clean and there was plenty of hot water. We would definitely score the whole trip as 5 out of 5 and have already been promoting Ethiopia to our friends. We can honestly say that there is nothing that we would have changed. If you get the opportunity please pass on our many thanks to the team in Ethiopia. I would thoroughly recommend this trip from start to finish with Tourdust. Rebecca was excellent in answering my pre-booking queries, including which trek to go for and for how long. She was a really valuable source of information. I found booking very easy and the pre-departure information excellent. The trip itself was fantastic. The local contact, Alex, was a massive help, especially when my bags with all of my trekking gear got mislaid on the flight between Addis and Gonder! Luckily, all of the luggage arrived in time. Our local guide was friendly, informative, support and overall just excellent. He was able to provide a very rich experience in terms of explaining the local culture as he had grown up in one of the villages in the mountains. His wider knowledge on everything from geology to fauna, flora and politics was also very helpful. The trek itself in beautiful and the landscape plus the wildlife make this a really unique experience. The camps were also comfortable and our food (plentiful) excellent. I was sadly unwell during the middle of the trip and so returned to Gonder for a day. Both the local team and Ben were brilliant in arranging this and were quick to take action. I can't thank them enough. Alex also arranged for my friend and I to return to the mountains for a day to see the things we had missed on my sick day. In short, the trip was great. Alex was a delight to meet and work with. He is very customer oriented and follows through on everything. Everything that was promised in the trip itinerary was delivered. Alex's staff was also exemplary. The trek guide was knowledgeable, friendly, and very accommodating. The cook (or more correctly the chef) was the best I've had on any trek (and I've been on many treks). The driver that took me from Gondar to the mountains was very competent and safe. His actions actually kept us from having an accident when a speeding truck coming from the opposite direction almost hit us. The accommodations throughout where great. 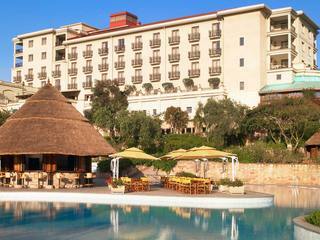 The Addis Regency had a great staff (very friendly) and the rooms were clean and the restaurant very good. The accommodations in Lalibela were also good. Alex changed me from the Jerusalem Hotel to the Lalibela Lodge. It's a newer lodge with large, clean rooms. The restaurant and service was good. As I told Alex, the rooms don't have televisions, but that was fine for me. Others may prefer a television. The rooms are wired for television and my guess is that they will be added at some point. I viewed the change as positive. The Fasil Lodge in Gondar was also very good. Overall it was a great trip. There were no glitches (other than an Ethiopian Airlines problem with a broken engine part that caused a 5 hour delay when leaving Gondar) I would definitely recommend Tourdust to others. You were easy to work with and delivered a great trip. Heather & I had a great time - with the guide and hotel in Addis and Lodge in Gondar all rated at highly. First of all I wanted to thank you for this wonderful trip that you organised for us. we had a great time! The choice of the hotels was great, all of them were clean and had a nice atmosphere. The food was great in general and so were all cooks. We had an amazing trek. We were extremely impressed with the organisation, logistics and execution of the trip by the local team on the ground - we didn't expect a trip to Africa to run so smoothly! Plus a lovely touch by a few hotels who acknowledged it was our honeymoon....petals on beds in Addis Regency and Gondar, with a free evening meal at the latter too! Thanks Tourdust, for showing us close up how people live in Ethiopia and its amazing wildlife. Everything, from start to finish, was perfect. Minalu, our guide, and Yohannes (Johnny) our driver, were absolutely wonderful. I had never taken a private custom tour before and was not sure what to expect. Minalu and Johnny were fabulous. I think what I appreciated the most was their flexibility and absolute sincere interest in showing us their country. I loved that over dinner Minalu would give us briefings on the history of the country. He was extremely knowledgeable and I truly appreciated learning so much from him. We would often stop in villages that neither of them knew so we could visit typical homes, or visit the markets. We also crashed a wedding near Hawzien as they thought it was something we should see. We were of course received with open arms by the people at the wedding and offered copious amounts of local honey beer. We made several spontaneous stops in villages when we saw a market or special event. There is no way we could have experienced this in a large organized group tour. When we were planning this trip you asked us right at the start what our interests were. So, we said we were looking for a trip that included lots of culture and history and a lot of photography. And this trip delivered on all counts. Minalu knew that I was very interested in photography and ensured that this was a big part of the trip. Johnny was great, stopping whenever we wanted to let us take photos. Minalu often intervened for us with the local people to ask them to have their photo taken. I could not have asked for more in terms of photographic opportunities. Well, maybe less haze and bluer skies, which Minalu tried to get for us. Our trip started with 2 days in Awash. The area does not have the abundant wildlife you would see in Kenya or South Africa but the huge plains of thorn trees and large herds of Oryx were quite impressive. We did see a few zebras, some austrich, antelope, warthogs, baboons, dikdik and the black backed jackal. My absolute favorite part of this area was our visit with the Afar people. We visited a local village with a local guide and got a quick glimpse into the lives of these nomadic people. My only regret is that this visit was very short. Accommodations in Awash were very good. The Anamalia lodge was a bit expensive for food, but we did get to eat antelope. After Awash we went North towards to more historic highlands area of Ethiopia. We stopped at Bati market which we toured with a local guide. We did miss the camel market as we got there too late. Our local guide should have taken us there immediately on arrival in Bati however we only went to that area of the market after lunch and it was over by then. The market itself is spectacular as there are people from all over the area. This was an incredible glimpse into the lives of the Ethiopian people. They come from all over to sell their wares, just amazing, like stepping back in time. 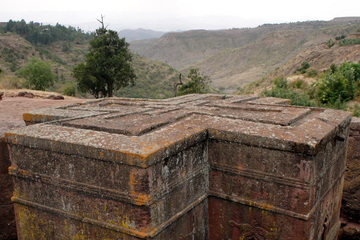 Our next big stop was Lalibela. Of course the rock-hewn churches are amazing. We had a wonderful day visiting all the churches with our local guide. But for me the next stop, Ghelralta was an absolutely spectacular highlight. I never expected this at all. We climbed to the top of mountains to see incredible rock hewn churches and monasteries from the 6th century. To me, these were the absolute highlights of the trip. Going up Abuna Yamata Goh is something I will never forget, and I really appreciated Minalu taking us up there. When we saw where we were going we thought he was crazy, but he and the guides encouraged us and helped us all the way up. It does sort of require nerves of steel to go up the sheer rock face and then the small ledge along the cliff to the actually church. The Gheralta lodge is probably the best place we stayed. It is quite isolated but so calm and relaxing and the food was delicious. I could have stayed there for a week just to relax and visit the sites. 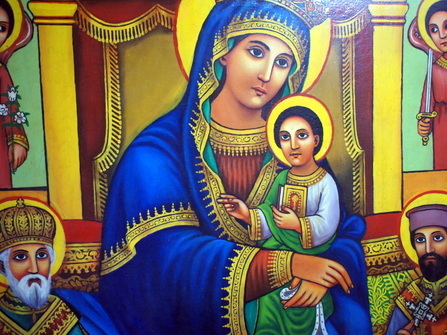 A short drive from Hawzien brought us to Axum, the ancient home of the legendary Queen Sheba. We toured all the ancient sites with an excellent local guide, and saw the resting place of the Ark of the Covenant. It was a very full day of touring which was great. The Simien Mountains was the next stop, three nights of camping. We were not sure what to expect but this whole trek was amazing. We joked about how many people it takes to take two Canadians camping. We had Minalu with us, and a local guide, a scout, a cook, the cook’s assistant, 4 mules and 4 muleteers. The service on the trek was top notch. Our cook was excellent. It is incredible to arrive at the camp after a full day of trekking in the mountains and have hot water waiting for us to clean up, a nice cup of coffee and popcorn. We had a bit of time to relax before dinner, then time for a short trek to see the sunset and wildlife after dinner. Our local guide set the perfect pace for us during the trek. The trek up to Inatye was difficult, but our local guide took his time getting us there. We got lucky and did not get any rain during the entire three days despite some menacing looking clouds. The wildlife in the Simiens is fascinating, especially the Gelada baboons. I loved these animals. They allowed us to get quite close to photograph them. They are fascinating animals, plucking the dried grass to eat the fresher roots. While trekking we came to valley in the midst of a Gelada baboon fight. The sound of the screaming baboons echoing through the valley was unbelievable. 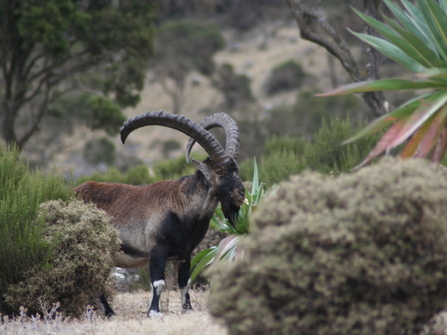 And of course in the Simiens we encountered the Walia Ibex. There were a few near out camp at Chennek, and then we saw a whole herd of them on a short trek we took on out last morning in the mountains. We must have spent more than an hour watching the whole herd descend from the top of a cliff to the valley. It was nearing rutting season so there was a lot of sniffing and posturing by the males. It was just a wonderful experience to see this. We also saw the Bush Buck, the Klipspringer and many birds like the Lammergeier vulture. One thing that surprised us was how populated the trekking area is. There were quite a few villages and lots of kids shepherding their flocks. It was kind of nice to see all the local people throughout the park. We stopped at a local house for a coffee ceremony during the second day of the trek. After our wonderful trek we headed to Gondar, with a quick stop at a Falasha village. This stop was not very interesting, more of a tourist trap than anything else. Our stay in Gondar was very nice. The hotel Fasil Lodge was very nice, and the restaurant was very good. The history around Gondar is fascinating, a visit to the old castles and churches was our morning activity, and in the afternoon we went to visit a monastery on Lake Tana. The whole area of Lake Tana is so different. It has a more tropical feel to it. The monasteries on Lake Tana near Bahir Dar were interesting. Perhaps after having visited so many churches and monasteries we were starting to feel a bit churched out, but the paintings and history of the area are very fascinating. Some of the monasteries around the lake are very touristy, perhaps this led to our feeling of this being less authentic. Lots and lots of stalls selling jewellery and other local crafts. We also saw the Blue Nile falls, the source of the Blue Nile and the Blue Nile Gorge. The falls are not what they were before the installation of a dam but just seeing the falls and the actual source of the Nile was amazing. And so to end my little trip resumé, I have reiterate that the whole trip was outstanding. The hotels we stayed at were all excellent, and the restaurants suggested to us by Minalu were as well. While it is difficult to choose my favorite parts of this trip, I would have to say the highlights for me were the visit to the Afar village, the monasteries and churches of the Gheralta plateau and the Simien Mountains Trek. 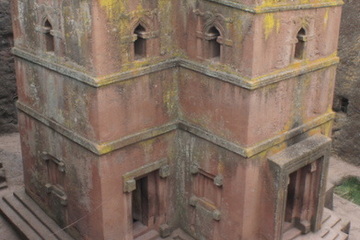 And seeing the churches at Lalibela was a dream come through after having read about them so long ago. The scenery was stunning from the outset. Our tents were generous to huge and offered a great vantage point to rest and watch the world go by at the end of a long day. April is late in the dry season with very hot, parched and windy conditions which we found challenging. Daily we coped with deep dust underfoot, dehydrating and abrasive sun and wind, temperatures soaring from the upper 80s down to sub-zero at night on the higher stretches. Our party were experienced trekkers and/ or runners so not fazed by the effort required. Shetu, Our guide, had a proud demeanour, a wonderfully understated sense of humour, coupled with a deep knowledge of the place, people and wildlife. All this belied his youth. Nagar, our cook, took pleasure in serving up nourishing, simple meals and readily adapted to our broad range of tastes and needs. Ginger and Thyme teas soon became a regular feature alongside the end of day snacks coffee and black tea. The first stretch through the park was busy with other trek parties and it offered us excellent acclimatisation with stunning escarpment views. Chennek camp gave close up encounters with Gelada baboons and Ibex. 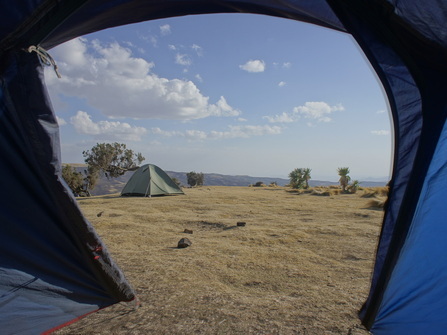 Walking out of the park, going East, we dropped down to Ambiko for the overnight camp en-route to Ras Dashen. From that point we left all visitors behind seeing only our support crew and local people for the rest of the trip. The climb to the summit was a long day, starting before dawn, walking ever upwards with local farmers, hawkers and construction workers for company. The summit was a scramble and rewarded us with magnificent views. Returning to camp exhausted our muleteers feted us with posies. As we journeyed out north we stayed at a variety of village and wild camps, sometimes finishing our evenings with a group sing song. On one occasion our cook and scout joined in. The wild camp at Sonar was in a dramatic, cliff top location with huge views and a special atmosphere. The following day we dropped down a spiralling path to the valley over 1,000m below. As we followed the river we saw a huge array of birds and other wildlife. The Simien mountain trek was a great experience. The views were truly awesome, I never tired of looking at the mountains as we trekked through them. Our guide and scout were fantastic and took great care of us, especially when altitude made walking more difficult. Our cook & his assistant also did a great job- food was plentiful and varied. All the arrangements made at local level were efficient and friendly. The support and advice provided by Tourdust pre departure was very good. Ethiopia is an incredibly interesting country and the people are very welcoming. Just to let you know we had a most successful trip. All went like clockwork. Your itinerary was excellent. All the personnel– guides, cooks, drivers etc could not have been more helpful. Many thanks for all your help and for opening up such a fascinating and complex country to us. We had a great time and would strongly recommend the trip. Tour dust facilitated our tour of Ethiopia, which is an amazing country! It is a beautiful country with rich cultural varieties. The mountain trekking on Bale Mt was a great physical challenge, but with a great reward. We saw many different animals and birds that I had never seen (or heard of) before. The trip through Omo valley was like a trip back in time, a view of life before it was cluttered with the conveniences of technology. The tribes are advanced in their own rite, by surviving without modern conveniences, off of the land. Our tour guide, Minalu was very knowledgeable and gave us great insight and information about the tribes. There were people from many of the tribes who not only knew him as a tour guide, but as a friend of the family. This made the experience a more personal one for us. One definitely needs to be a bit adventurous to travel in Ethiopia, but the inconveniences are well worth it. Thanks so much! These are memories that will not soon be forgotten. We booked a hike in the simian mountains with tourdust because Danielle and I were on a very tight schedule with work and had no time for anything to fall through when we got there and also the big companies were very inflexible with their leaving dates. Danielle actually didn’t read any of the emails I was forwarding her that Ben had sent us until a few weeks before we left to go to Kenya and then had a last minute freak out that I may have booked something dodgy over the internet. But she was very impressed by how thorough the tourdust emails were, especially their detailed advice on what to expect and what to bring, It was obvious that the people who run tourdust have done the walk themselves before and they give very sound advice. The guide in Ethiopia was also very approachable by email and gave us advice, as we wondered whether the famine had affected the area and he was able to reassure us. When we got to Ethiopia we met the man who runs the walks from Gondar and he gave us some last minute advice for the next morning and also we got to talk about diet as I am mostly vegetarian, which they could accommodate. The next day we were picked up from the hotel and drove to the mountains. We met our guide there, and also the cook, cooks assistance, scout, and muleteers. You walk in the daytime with just a guide and a scout and the others beat you to the camp and set up! We did see some people walking with the minimum “support crew” which is just a scout (which you need to legally camp in the mountains- they have a machine gun to protect you, although it is not at all that dangerous, it’s mainly to give the local people some work.) those people did look a bit uncomfortable at night time because it does get cold and it is hard to organise your own camp food and fire! You would have to be more organised than us to do it independently. The staff were very friendly. The cook and the guide spoke excellent English and were very entertaining. They really looked after us and made sure that we were comfortable. The guide was careful with the pace to challenge but not exhaust us. I had never hiked at altitude before and was surprised at how puffy I was. The guide knew a lot about the birds and animals and geology of the mountains which was interesting. He also taught us some Amharic which was entertaining (especially our pronunciation!). The food was good (it was faranji food)- cooked hot every night. It does have a lot of MSG in it- but maybe if you asked for that to be kept out earlier they wouldn’t put it in, I’m not sure. They certainly feed you enough (or too much!!). They set up a fire for you at night time, which is very welcome as it is cold! All in all, the walk went very well. It is a beautiful area, especially at that time of year. You walk over fields of wild thyme and wildflowers, it smells and looks heavenly. And you have the sweeping panoramic vistas of the mountains of course. Photos don’t do it justice. You can see massive birds of prey circling the thermals underneath you. You are so high up that it feels a lot like what being a bird must feel like at times, except that you still have your feet on the ground! You walk through some of the smaller villages as you get to the end of the trek which is also very pleasant. You see some wildlife and a lot of domestic animals! You camp at the same camp sites as the other faranji doing the hike. It’s very cold at night so bring warm sleeping things and coats! I did get sick on this trek, though through no fault of the guides or staff! All the staff were absolutely lovely and very caring, making me special foods and drinks and setting up a place for me to lie in the shade. We had to stay a day extra at a camp site and they reorganised the whole trek around it- they provided us with some alternatives and we got to choose what we wanted to do. All in all, I would recommend this trek booked with tourdust highly. Their local operator was a good one and we had a great trek! Tourdust was very supportive by email and I have trust in their advice. It’s very hard to book something over the internet as there is a big fear that you are throwing your money into the wind and will be left at the airport so to speak, or that you are booking something that will be frustrating and dodgy. In this trek they have chosen their local operator well. I would book another trek with them if I was similarly strapped for time. I would also recommend them to friends who were looking to trek. The simian mountains are an absolutely beautiful relaxing experience and a great walk!